I’m Patty Mazzoni, the Early Childhood Manager for Salt Lake CAP Head Start in Salt Lake City, Utah. This summer I am teaching a class on Social and Emotional Teaching Strategies for Young Children. The class offers a variety of techniques to help children learn the importance of getting along with others, problem solving, classroom practices that prevent challenging behavior and positive parenting that promotes children’s social and emotional development. Before we begin to teach these strategies, we focus on the foundation of an effective early childhood education program. This foundation is a positive, supportive relationship between teachers and children as well as families. Good relationships are key to effective teaching and guidance in social, emotional and behavioral development. A positive teacher-child relationship built on trust and understanding will foster children’s cooperation and motivate and increase their positive outcomes in school. Your potential influence on children’s behavior grows significantly; children notice responsive caring adults. Children pay particular attention to what such a teacher says and does. Children seek out ways to ensure even more positive attention from the teacher. The time spent building a strong relationship is probably less than the time required to implement more elaborate and time-consuming strategies. You will feel more positive about your job. You will begin to see a ripple effect. Children will become more skilled at building positive relationships with other children. Next time a child pushes your buttons, think about this metaphor. Think of a piggy bank. Are you making a deposit in this child’s life or are you making a withdrawal? You can make an impact on a child’s life by building a close, nurturing relationship. Patty Mazzon is the Early Childhood Manager for Salt Lake CAP Head Start in Salt Lake City, Utah. She manages early childhood services for 150 staff and 2,000 children and families. For the past seventeen years she has worked with children with Special Needs. She also consults on the Achievement Products catalog for children with Special Needs. By John Funk, Educational Product Manager, Excelligence Learning Corp.
To keep up the ever increasing demand for individualization, many education settings have been implementing the Response to Intervention (RTI) system of teaching. RTI was initially started to help special needs educators have more support and continuity with the classroom teachers. However, Response to Intervention is an excellent way for educators to track the individual progress of all the children in her care. Although RTI began in the school age education systems, it has now filtered down to early childhood. Public preschool programs, as well as Head Start agencies, have started using RTI as a way to help teachers individualize and for special needs to be more inclusive in classroom instruction. Tier 1: (Large group instruction) The teacher must organize a road map of developmental skills and track the progress of each child in mastering each skill. This tier targets 80-100% of the entire group of children. 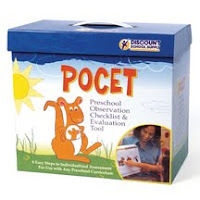 POCET (Preschool Outcomes Checklist and Evaluation Tool), from Discount School Supply is an excellent example of Tier 1 teaching because it provides a road map of skills and an easy way to track the progress of each child. Tier 2: (Small group instruction) In Tier 2, the teacher responds to children with known risk factors and skill deficits. In other words, the target children for Tier 2 are those who have not mastered the skills during whole group instruction. This kind of intervention can usually take place in small group settings. Tier 3: (Individual instruction) This tier provides additional reinforcement, along with intervention from appropriate personnel, to children showing a continual need for developmental support. By the time the teacher reaches Tier 3 with a student, the teacher has so much background information she can make more informed decisions about support and help for truly special needs children. I think RTI provides an opportunity for teachers to more efficiently individualize instruction for each member of her class.